Since the retirement of Dr John Wilch in 2002, CLTS has not had a full-time Old Testament professor. As any pastor or seminary student will attest, Old Testament is a true specialty not easily mastered, owing to the vast size of the Old Testament and the complexities of the Hebrew language. We are thankful that for many years we have had two local pastors available who had graduate degrees in Old Testament, and were able to serve regularly as guest instructors: Pastors David Duke and Gerson Flor. Two years ago Pastor Flor entered the Canadian Forces as a chaplain, and we decided to use this loss as an opportunity to test pilot joint teaching with our sister seminary in Edmonton. 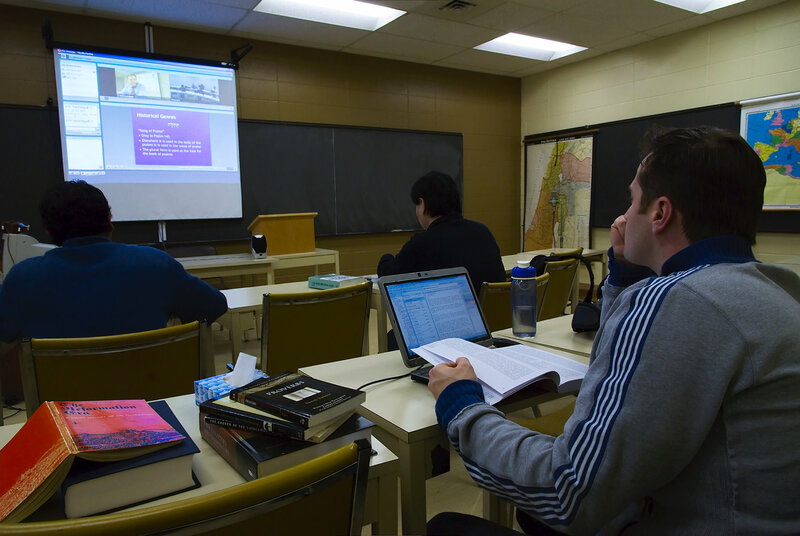 In 2009-10 Professor Kraemer Pentateuch class was shared with CLTS students through online technology. Each student was able to sit at his laptop and see the teacher and the documents he was discussing. Unfortunately, this left the students somewhat isolated from each other. This term we are piloting a “smart classroom” alternative. In both locations the students are gathered in a single classroom, and are able to see each other on a large screen. As with any high technology project, it has not gone without a hitch. One day the connection was lost for fifteen minutes. Manning the equipment can be somewhat distracting for the students. (Neither seminary has a full-time IT staff person.) But the students agree that it has been a positive experience to add another expert voice into the mix of their theological learning. The two faculties are currently making plans to share four courses in this manner next year.